Cathy McMorris Rodgers posted this on her Facebook timeline yesterday. Surprisingly, the majority of the comments are calling her out on her hypocrisy. So what's the deal here? 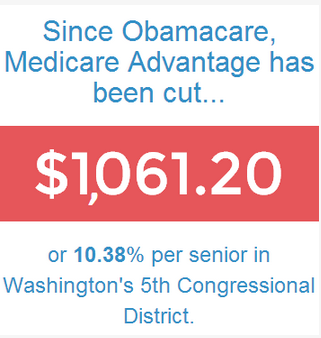 Medicare Advantage Plans are still Medicare but they're offered by private companies. These companies must follow the Medicare reimbursement rules, but they can charge different out-of-pocket expenses and they can set different rules for obtaining services like specifying which doctor or facility you can go to. (Remember how our congresswoman was so concerned with the government telling you where to go for health care? Not so much when it's a private company doing the same thing.) Medicare beneficiaries are not required to use Medicare Advantage, but they can if they choose to. And they can choose which plan they want. The term of each plan is one year. There's a ton of information about Medicare Advantage that eligible persons need to research before they make a choice. At UnitedHealth Group, one insurance giant, Medicare Advantage plans account for a fourth of all profits, said Ana Gupte, an industry analyst for Leerink Partners. Another, Humana, owes two-thirds of its profit to Medicare Advantage, she said. So you can see why the insurance companies are against lowering the subsidies.